First, the detours. I'm not sure if I have told you how good we are at planning things out, so I am going to fill you in on how we roll. Our usual routine before we go to bed is to look at the map, check the weather, see what is close by (or far enough to avoid weather), and go there. That's it. Nothing is planned out beyond the next 24 hours. It leaves us an endless amount of possibilities and it's worked pretty well for us so far. Part of the problem we have with scheduling beyond 24 hours is that we are just plain lazy, but mainly, it's because we like the flexibility of being able to stay in any particular spot for the perfect amount of time. Why rush somewhere else when we are perfectly happy where we are at, and why stay in a spot longer than we want just because we planned on being there??? See the logic? I know, I know...it probably makes no sense, but trust me when I say that it works for us. Anyway, back to the detours. Before we left Shasta Lake, we followed our normal routine and found our next spot. Off we go. 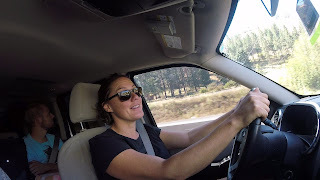 Well, about an hour into our drive, thanks to our handy-dandy smart phones, we found out that if we took a left turn in about 10 minutes, we could go to the most popular white-water rafting and kayaking river in all of the US. Since a little bit of fun on a river sounded like more fun than the other place we had planned on going the night before, a left turn was in order (I don't remember where we were originally going but it was pushing 90 degrees and a dip in some cold water sounded great!). Left turn...check...and another hour later, we had our home-on-wheels on the bank of the South Fork of the American River. Since all I wanted to do was run a section of the river and maybe take a dip to cool off, I needed something that would float me down the river. We don't have kayaks and we don't have river rafts, but what we do have is some paddle boards...and what do you know, they float. Perfect. River running on a paddle board (pretty fun) and a dip in some ice cold water...check. It's a great way to beat the heat. That night, as we were working long and hard to come up with a plan for the next day, we noticed that we were pretty close to Lake Tahoe and some pretty good hikes in the High Sierra's (this plan only took about 18 seconds, which is about 12 seconds shorter than most of our planning takes). We head out bright and early and on our drive to Lake Tahoe we noticed a beautiful State Park that our trusty map says has some historical significance. Since we love some historical significance, I guess we should check that out tomorrow (tomorrow's plan is now complete and it only took 14 seconds). We go and we take care of a couple of hikes in the high country, we swing by Lake Tahoe and check out a couple of the beaches, we put our tosies in the water, and then we grabbed some dinner in town. Another pretty fun day was had in the mountains and at a beautiful lake. The next day we head back to the state park that we found on our way to Lake Tahoe. This state park, Sutter's Mill, as it turns out was where gold was first discovered in California and is recognized as what started the famed gold rush out west in the mid 1800's. They had some pretty interesting artifacts, a great little museum, and bunches of hiking trails for us to roam around on. We learned a bunch and had a fun day wandering around the park. What did we learn you ask? Well, we learned a bunch about mining and California's history, but also, we've run into some reoccurring themes at just about every historical site, museum, and national park that we have visited in the past year (we've visited a lot of them, so these facts are finally starting to sink in). First of all, Native Americans were everywhere and the white man pretty much wiped them out (this is a pretty well known fact that we have already been pretty well aware of so not much news with that one, but EVERY place we visit reinforces this). Secondly, Chinese labor was used extensively in the west to build everything...and I mean everything. They were treated terribly, paid next to nothing, and taxed more than they made. Basically slave labor without the word slavery attached. And thirdly, Mormon's were involved in some form or another of settling the entire west (this is another fact that is displayed at EVERY historical site). I always assumed they got to Utah and stayed put, but they spread out like wildfire and built just about every wagon road and outpost that was used by pioneers in their journey across the country. So the next time those Mormon missionaries ride up to your doorstep on their bicycles, before you slam the door in their face, give them a friendly thanks for helping build our country, and then do the door slamming when you shoo them away. And that wraps up the last few days which brings us back to where we are today...at Yosemite. We were both pretty excited to get here. Maybe a little too excited. On day one at Yosemite, we hiked a little over 15 miles...which if you are wondering is about 5 miles past what my poor feet are willing to carry me. We started out the day thinking that we would just get the lay of the land and maybe stop by a couple of the short hikes. Maybe we would just see some of the roadside attractions...you know, the easy stuff today so we can get after the good stuff tomorrow. Well, that didn't work out so well. We did a couple of the short hikes...and then just kept on hiking. The problem with “just kept on hiking”, is that at some point you have to get back to where you started from. Which is why my barking dogs (feet = ouch) are reminding me that “just kept on hiking” wasn't such a great idea. So here we sit. Our nightly planning ritual is about to commence. Brenda was mentally preparing for tomorrow as we were hiking today so she already has a pretty good list of hikes she wants us to go on. I have already checked the weather for tomorrow and it looks like a big thunderstorm and rain is supposed to roll into the area. I am hoping that a thunderstorm will trump her list of hikes for a day so my dogs can, dare I say, rest. I've heard through the grapevine that retired people are supposed to rest and relax. I haven't experienced these things called rest or relaxation yet, but I hear they're great. 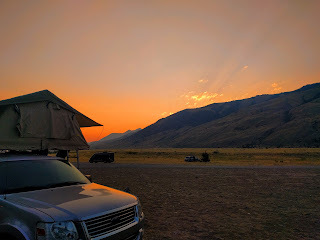 We actually have a bunch of pretty incredible photos from our last few days, but the internet connection at the RV park we are staying at is amazingly slow so when we get out of here and back to a good connection, we'll catch you up on what we've been seeing. Love your blog. Our adventure at Yosemite and Giant Sequoia was very similar to yours. We love your pictures. We didn't see the bears because we were too early. Keep your fun meters pegged.